On the ICOYC cruise, the most remarkable club facilities were the amazing outstations. I am not aware of any Australian yacht club having a camping-gathering facility in another nearby waterway. The outstations we visited belonged to either the Royal Vancouver and Seattle Yacht Clubs. They were an incredible resource to the flotilla cruise. 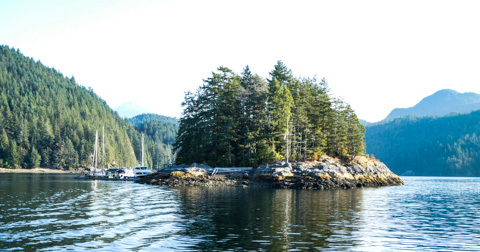 Here is a photo of Alexandra Island, a small island, 18 nautical miles NNW of the Royal Vancouver home port of Jericho, with very little infrastructure but 1200 feet of dock space. There are walking trails, a open air pavilion and picnic tables. On the eastern shore there is a drying reef, with logs laid up against the reef, so no one would sail into it. When you are on the top of the island looking down, the eastern shore is on your right and the dock space is on your left. The tiny bay looks much like a letter U. When we arrived people told us to hurry, Orcas were swimming on the far Eastern shore. We jumped off the boat and could see Orca’s in the distance. Then we heard about the afternoon’s events. 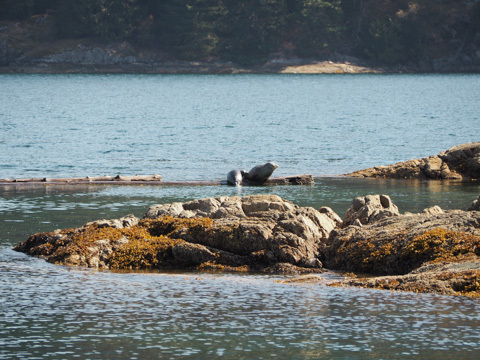 This blog is reporting an amalgamation of eye witness accounts, including one mention of “Never in my 35 years of visiting Alexandra Island, have I ever witnessed Orcas or seals at Alexandra Island. To say that everyone who saw the sight was stunned by what transpired. The photos were taken by another flotilla member, Jan Horhammer. Jan was gracious enough to allow me to use his photos to give you an idea of what occurred. 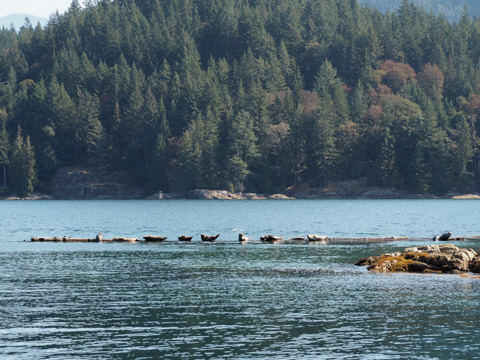 When some of the early yachts arrived, there were a number of seals sunning themselves on the logs. The seals were far enough away from the dock to be unconcerned by the yachts and a few people swimming off the dock*. Suddenly a large Orca swam near the dock, before ramming the inside of the logs, which saw several of the seals dive off out of reach. They seemed to think they had escaped the Orca. What they didn’t know was the rest of the family were just around the corner. We did see a seal in the shallows but there was no evidence of the carnage that had taken place. 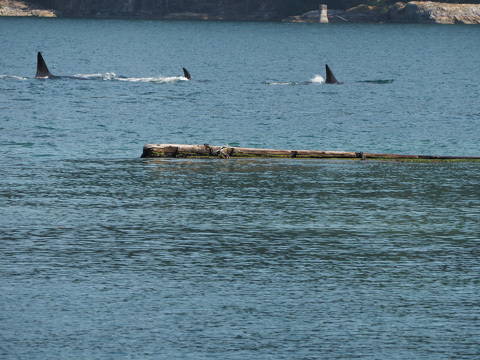 The Orcas were just out for a bite of lunch. * A recent article mentioned transient Orca pods are more likely to be looking for seals. 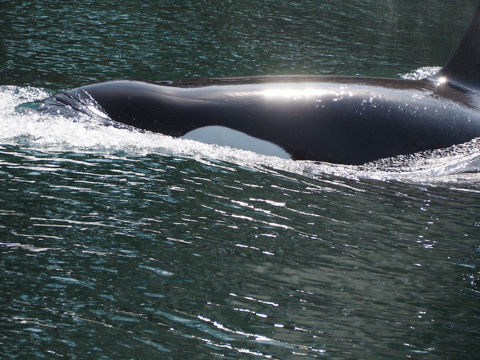 Orca populations from the BC-Seattle area feed on Chinook salmon.